HP still NOT porting HP-UX to x86? The Oracle and Hewlett-Packard lawsuit over the fate of Oracle's software support for Itanium processors, and therefore HP's HP-UX Unix variant, is under way in the Santa Clara County courts. New HP CEO Meg Whitman is making the rounds in the press and making her case to HP customers and partners at the Discover 2012 shindig in Las Vegas this week – and so there was lots of talk about the past plans and current plans for HP's Integrity and Superdome lines of servers. And some of the talk turns out not to be true. Even if that talk comes from none other than Whitman herself. The reason we went to the mat with Oracle on this was because we have a lot of customers on Oracle Itanium who do not want to switch, do not want to get off of HP Unix and on to something else. And they kinda like what they have and they'd like to stick with it. I think either way, Dave's got in the works the next generation of Business Critical Servers on a more open platform. It's called Odyssey, which is pretty cool. Ultimately we’ve got to build Unix on a Xeon chip, and so we will do that. First of all, the HP division in question is called Business Critical Systems; it hasn't been Business Critical Servers for years – although, frankly, El Reg and many HPers still make the same mistake. But Unix on x86 – and specifically HP-UX on x86 – whaaaa? Whitman was referring to Dave Donatelli, who heads up HP's Enterprise Servers, Storage, and Networking group, and to Project Odyssey. This is HP's plan to continue to support HP-UX 11i v3 on current and future Itanium processors from Intel, to bolster Linux and Windows with mission-critical features available in HP-UX, to create a Xeon blade enclosure, code-named "DragonHawk" that looks like the current Superdome 2 chassis for Itanium 9300-based blades, and hardware called "HydraLynx," based on a future Xeon processor from Intel, that in effect makes a Xeon-based Superdome to run these beefed-up Linux and Windows operating systems. And presumably the DragonHawk chassis will allow for Itanium and Xeon blades to slide in, side-by-side, sharing storage and switching. Back in November, Lorraine Bartlett, vice president of worldwide marketing, strategy, and operations for the BCS division, and Kirk Bresniker, vice president and chief technologist, were very clear that the plan was to get needed RAS features into the future Xeons, contribute features from HP-UX to the Linux kernel, help Microsoft make Windows more rock solid, and take another run at porting its MC Serviceguard high availability clustering software to Linux. Bresniker said back in November that it was not going to do a port of HP-UX to x86, although it was technically feasible. As it turns out, what HP was not willing to say was that it had already done a port, and thanks to the internal documents that Oracle got through the discovery process in the Itanium case and dumped onto the internet, we know that it did at least one port called Project Redwood, and even booted it up on x86 iron on December 29, 2009. The Project Redwood plan was ambitious, and even included a Red Hat Enterprise Linux application binary interface so you could run apps compiled for RHEL inside of HP-UX for x86. The developer release was slated for the end of 2010, with support for Xeon-based Superdomes expected at the end of 2012. It looks like HP was also planning to support HP-UX inside a VM atop the ESXi hypervisor from VMware on top of its ProLiant DL980 servers in mid-2011. That was the plan in early 2010. But that plan was killed. HP announced in Nov. 2011, "Odyssey" a project to redefine the future of mission-critical computing. It includes a development roadmap that will unify UNIX and x86 server architectures to bring industry-leading availability, increased performance and uncompromising client choice to a single platform. We pointed out that this statement didn't actually clarify anything, and in fact muddied the waters even more – and, moreover, noted that HP was mixing hardware and software in discussing architectures. We're still waiting for a line that simply says that Whitman misspoke when describing what Project Odyssey is, or that Whitman accidentally pre-announced a third attempt at porting HP-UX to x86 iron. Whitman is whirring around with the layoff axe, trying to remove 27,000 people – about 8 per cent of the HP workforce – over the next two and a half years. Given that BCS sales are plummeting, the division is probably slated for deeper cuts than other HP units, so no one at HP is exactly willing to go on record to say the boss was wrong. Or pre-announcing yet another port. Yes, this is silly. But HP is jumpy about all things HP-UX these days. As far as we know, Project Odyssey was still proceeding on plan and without an HP-UX port as of Thursday, May 31, when Bartlett and Bresniker got on the horn to clarify what the plan of record was for its Itanium and Xeon server development and HP-UX in the wake of El Reg's publication of the details of Project Redwood and ahead of the Oracle-HP trial and the Discover 2012 event. HP has not made this widely known, but Martin Fink, senior vice president and general manager of the BCS division, which also peddles OpenVMS and NonStop systems, put out a statement to Itanium server customers explaining that "at no time prior to Oracle’s announcement on March 22, 2011 did HP have a committed plan to discontinue use of Itanium for Integrity servers." The plan of record as of June 2010, when HP was negotiating with Intel, was called "Project Kinetic" (more on that in a moment), and it had some more ambitious elements of Project Redwood and Project Odyssey mixed together. And that was the plan until HP had a rethink in the wake of Oracle's announcement in March 2011 that it would not support future Itanium processors running its current and future software, and neither would it support current Itaniums with its future software. This "Update for HP-Oracle Joint Customers" signed by Fink also reiterated that the current plan was to keep NonStop, OpenVMS, and HP-UX on Itanium, and to beef up Windows and Linux for a future Superdome-like machine based on Xeons. Bartlett and Bresniker said much the same to me when discussing what the old Project Kinetic plan was. Here's the good bit to all of this: HP and Intel were committed to finally delivering a common processor socket for Itanium and Xeon processors, and HP actually had two different HP-UX porting projects. Project Redwood, explained Bartlett, would have a single code base for both Itanium and x86 processors, like earlier versions of HP-UX 11i did during the transition from PA-RISC to Itanium. But with the Kinetic plan, HP's NG-UX strategy was to break HP-UX into two distinct code bases: a future version for x86 machines and the current HP-UX 11i v3 stack tuned up and extended indefinitely running on the Itanium machines. Mark Hurd, now co-president of Oracle, was on board with the Kinetic plan as of June 25, 2010, as was Donatelli, and the presentation, presumably put together by Fink, says that Paul Otellini, Intel's CEO, and Kirk Skaugen, in charge of Intel's Data Center Group, would also add support. Apparently there were some items that still had to be negotiated. The Kinetic plan called for the future "Kittson" Itanium processor, expected around 2014, to be socket-compatible with a future Xeon chip, presumably an E7 (sometimes called a Xeon EX) chip in the "Ivy Bridge" family. Neither Bartlett nor Bresniker would confirm if a common Itanium or Xeon socket is still in the works, and Intel has not said so either. Given the falling demand for HP-UX servers, it would not be surprising at all that it was indeed in the works for the Kittson Itaniums, and that in the wake of Oracle's pulling support, Intel and HP have decided to make Kittson – whatever it is – socket-compatible with the current quad-core "Tukwila" Itanium 9300 and impending eight-core "Poulson" Itanium processors. What we can say is that in June 2010 HP was gung-ho about a dual-processor, converged server platform running HP-UX on both Itanium and Xeon, a bet that cost money for both software and hardware development for HP itself, and that would require HP to pay Intel hundreds of millions of dollars to continue developing Itanium chips. Then Oracle made its announcement in March 2011, and by November 2011 HP had changed its mind about an NG-UX port to x86 iron, Intel and HP are not confirming the common socket, and Project Odyssey is all that is left. "We're not disclosing future plans, and Intel is not ready to talk about the Kittson strategy," Bartlett explained about the future Itaniums. "Intel is definitely committed to their Itanium roadmap, which has Kittson at 22 nanometers." 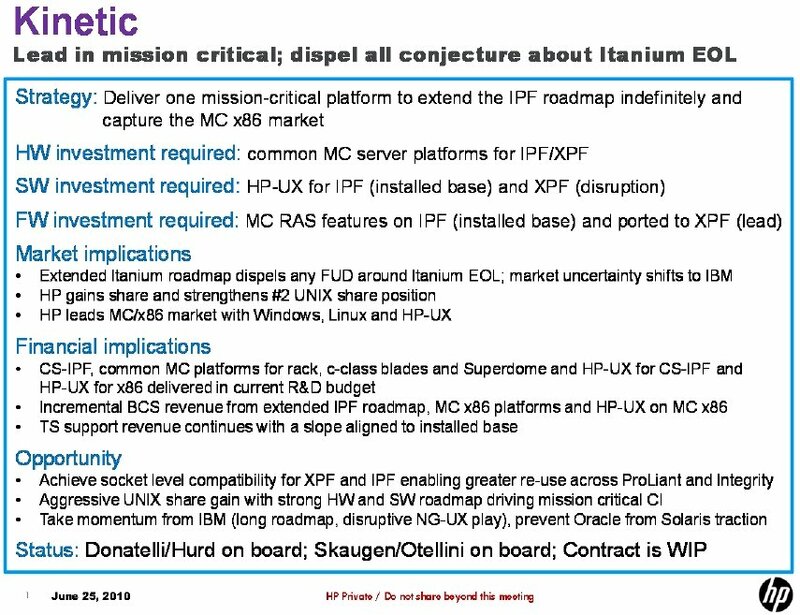 The Kinetic document, dated May 30, 2012, says this very clearly: "HP is committed to the continued innovation of NonStop, OpenVMS and HP-UX on Itanium-based Integrity servers. At the same time, HP is developing enhanced services, highly scalable and resilient x86-based servers and is working with Microsoft, Red Hat and open source communities to deliver a UNIX-like mission-critical experience for the x86 environment. HP has no current plans to bring HP-UX to the x86 architecture. Further roadmap decisions will be based on customer and market demand."